Providing opportunities to transform the lives of students living on the thin edge of poverty. While Cambodia has experienced an increase in wealth over recent years, the disparity between the rich and poor remains stark. Those on the lower end of the socioeconomic spectrum face significant financial, health, and educational challenges. The realities of slum life are difficult to fully grasp. EYC students live in vulnerable housing structures surrounded by open sewers, uncollected garbage, harassment, gambling, drug dealing, prostitution, alcoholism, and domestic violence. A constant threat of eviction adds ongoing anxiety. Our students live on the thin edge of poverty where they are just an illness, job loss, death, or eviction away from having to drop out of public school. Many young kids have to help support their families by working in a garment factory, selling food on the street, scavenging for garbage, or sometimes worse. Often they are exhausted trying to balance school and work to do well in school. These challenges are even more profound for our girls and young women who face daily inequities because of their gender. EYC is a collection of hundreds of talented young people hungry for change. 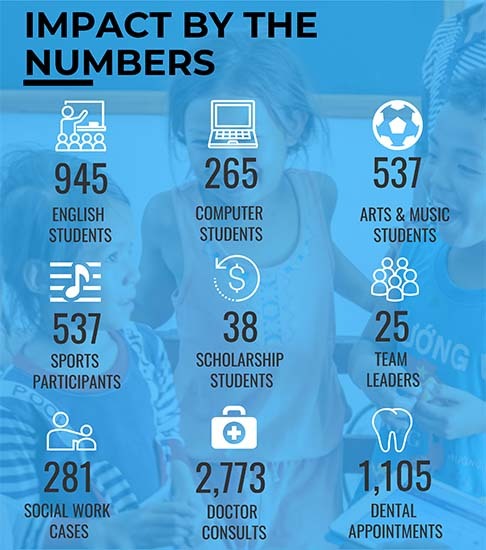 The number of students and community members we serve represents the scale of impact, but the true impact is shown by the individual stories of lives transformed. "I'm so glad I got to meet the EYC students and see firsthand the work EYC is doing. During my school visits, the kids were all smiles as they proudly stood up and told me their name, age, and what they like to do for fun. Some of the kids added what they hope to do when they grow up. As I listened to them I thought to myself, 'I really hope she actually becomes a “civil engineer” or he becomes an “art teacher” one day'. I honestly believe EYC is helping them get there. I talked with the kids about their travel dreams, favorite ice cream flavor, among other things. It was so fun to hear their answers. One student said he wants to travel to Portugal because he loves soccer. Another student said New Zealand because she wants to hike the biggest mountains. The reality of life right outside of the schools that I saw is more difficult than any kid their age should ever have to experience. Despite this, the kids were sweet and special and full of potential."